MOA’s Outreach Kits cover a number of different subjects and are the perfect tool for enhancing your classroom lessons. Kits contain hands-on objects, photographs, activities, labels, instructions, and historical materials. The kits are designed to be used by any grade level, with the level of study and complexity of content determined by the teacher. The Becoming Human kit, however, is intended for a high school audience. Kits are available for a $20 non-refundable rental fee per week (Becoming Human is $30 per week). To reserve a kit, please contact the Museum Of Anthropology at 336.758.5282 or moa@nullwfu.edu. This kit provides an assortment of Native American games ready to play. Kit includes instructions and historical background materials. 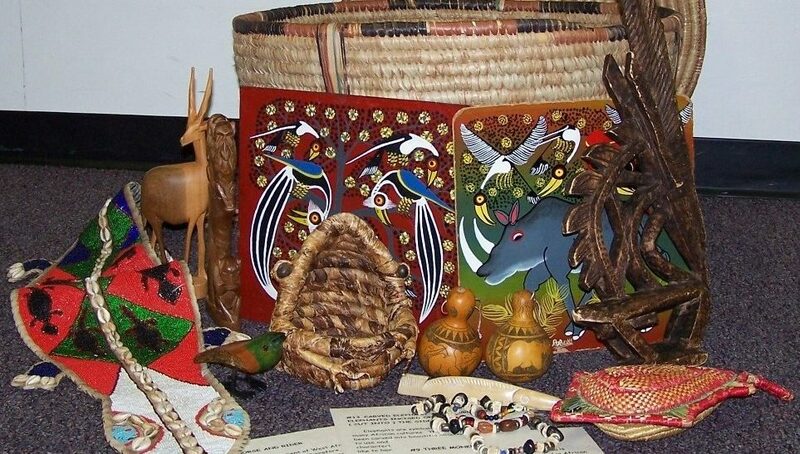 This kit contains an array of authentic Yadkin River Valley Native American artifacts with information panels about archaeology and discoveries into the lives of the first Carolinians. This kit contains modern-day Chinese folk arts that have their roots in ancient Chinese traditions. Included are hands-on objects illustrating various arts and skills, labels, and a teacher’s guide. This kit is full of assorted African instruments for students to examine and play. Included is an information packet with photographs and suggested activities. Elephants, Snakes and Crocs, Oh My! This kit has hands-on one and two-dimensional African art with animal themes and examines African approaches to art. Objects, labels with stories and proverbs, picture card observational activities, and teacher’s guide are included. This kit has nonhuman primate, hominid, and human skeletal replicas and casts. It discusses the development of the primate biological model that leads to modern humans. The kit includes teaching materials, lesson plans, and introductory CD. Interested in a topic you don’t see here? We may be able to create a custom kit for you. Contact the Museum at 336.758.5282 or moa@nullwfu.edu for more information.